Our long-awaited twin granddaughters arrived last week, beautiful and healthy. They are identical, and were born with a rare condition called Twin-to-Twin Transfusion Syndrome. 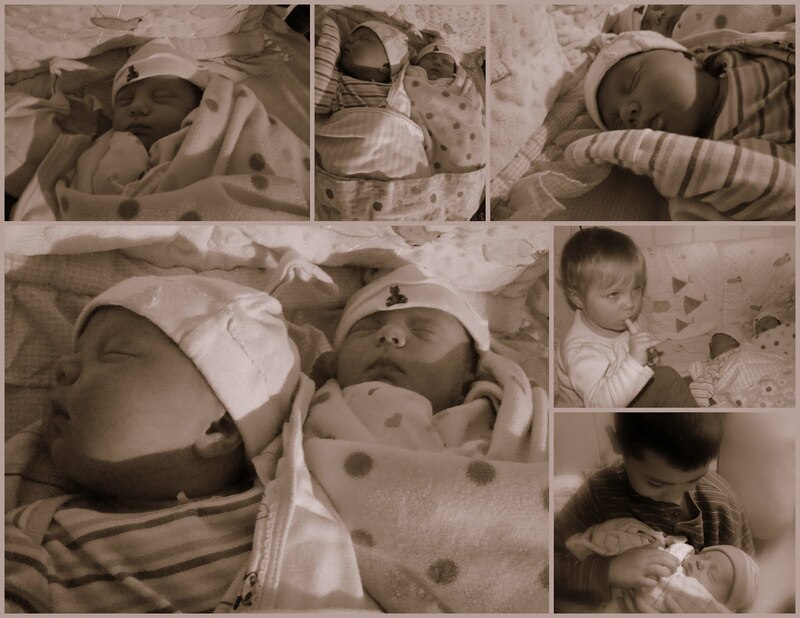 TTTS occurs in approximately 5-20% of identical-twin pregnancies. When it occurs early in pregnancy, it can be between 80-90% fatal. What happens in TTTS is the twins share their blood supply through their single placenta. One twin gets too much blood, and the other twin doesn't get enough. The condition is very dangerous for both babies. The over-supply and under-supply of blood can cause a myriad of problems, including organ damage, and often death in both babies. TTTS is why one of the twins was born over a pound larger than her sister. Normally, identical twins are much closer in size. Fortunately, regular fetal monitoring, their mama's excellent health and strong maternal instincts, the fact that the babies didn't develop TTTS until late in pregnancy, and good medical care helped minimize the problems. We don't anticipate any lasting issues with their health, growth, or development. Our entire family feels very relieved, joyful, grateful, and blessed welcoming our precious new additions into our lives. 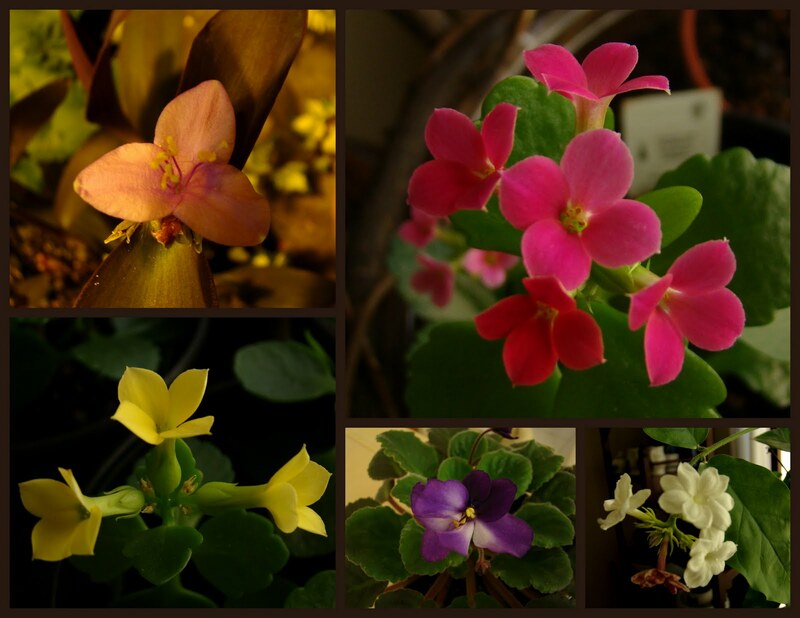 Clockwise from top, left, Tradescantia pallida, (also known as Setcreasea purpurea or Setcreasea pallida,) pink kalanchoe, Sambac jasmine, African violet, and yellow kalanchoe. While we have no garden blooms in January, our dining room is home to houseplants and a few overwintering potted plants from the patio. The Setcreasea is in the basement with many other overwintering leafy and blooming things. All help freshen the indoor air. The jasmine's fragrance fills the dining room, and the other blooming things bring welcome color, life and beauty in the dead of winter. Happy Bloom Day, and for more January blooms, please visit Carol at May Dreams Gardens. This New Year's Day, One Seed Chicago kicked off the voting in its annual campaign uniting Chicagoans in a season-long celebration of urban gardening and local eating. This year’s candidates are basil, chamomile, and cilantro. One Seed Chicago suports novice and experienced gardeners learning to grow the winning seed in their gardens. Just like last year when vegetables were on the ballot, chefs and foodies are encouraged to submit recipes for these herbs for inclusion on the One Seed Chicago website. Participants vote for their choice using the ballot at www.OneSeedChicago.com. The plant with the most votes wins. Voting closes on April 1st, and the winning seed will be unveiled at the Green and Growing Urban Gardening Fair at Garfield Park Conservatory on April 30th. Free seeds will be distributed at the fair, and subsequently mailed to Chicagoland residents who participate in the website vote. One Seed Chicago is a project of NeighborSpace, Chicago’s land trust for community gardens. It encourages community by bringing us together in a common gardening project and introducing more Chicagoans to the joys and benefits of gardening. Previous One Seed Chicago winners were sunflowers in 2008, Blue Lake pole beans in 2009, native beebalm/monarda in 2010, and Swiss chard last year. Since 2008 One Seed Chicago has distributed over a million seeds to Chicago-area residents. NeighborSpace is a nonprofit urban land trust dedicated to preserving and sustaining community-managed open spaces in Chicago. Their growing network of gardens provides thousands of people the opportunity to grow fruits, vegetables and flowers, to restore habitats, and to create unique gathering places in their own neighborhoods. For more information, please visit www.neighbor-space.org . My vote this year went to chamomile. I've never grown it before. I chose it for it's pretty, daisy-like little blooms, and because I've grown basil and cilantro for many years. Chamomile is an aromatic plant, and makes a good companion for vegetables in the brassica family. It's said to enhance their flavor, discourage cabbage worms, host hoverflies and wasps, and to accumulate minerals such as calcium, potassium and sulfur in the soil.